Getting ideas for styling a small living room can be a struggle. It’s hard to know how to arrange your coffee table, hang your artwork and position your sofas in order to make the most out your compact space. A good understanding of the space you do have will help you make design choices that bring your small living room to life and create an environment that thrives no matter the square footage. If you’re looking for some interior ideas to maximise the impact of your small room, read on to find out some useful tips and tricks. When you’re limited on horizontal space in your room, look upwards to see how you can play with vertical space. If you’re looking to achieve the illusion of a larger area in a small living room, drawing the eye upwards is an effective way to distract from a narrow view. A gallery wall, although seemingly cluttered, can in fact be a genius way of tricking the eye into believing the room is bigger than it is. Use two thirds of the wall height from the top down to lift the attention toward the ceiling. Rooms with high ceilings have a traditional appearance and will maintain a sophisticated feel even when limited in size. Take advantage of this by opting for lower seating that emphasises the space from floor to ceiling to accentuate the height of your living room in a way that exudes luxury. Who said bigger was better? Sometimes, the best way to accentuate a smaller living room is to enjoy it for what it is. Embrace the intimacy of a more compact living area by arranging seating close together. Work with interesting angles rather than lining your furniture to the wall for a more dynamic look that gives the room more intrigue. Hang pendant lights with slender shades above side tables to invite warm light in without making things claustrophobic. Jewel-toned hues can adorn the walls to add a sense of luxury without feeling boastful or brash, acknowledging the more compact size and infusing it with a sense of romance. Natural light will help flood your living room with openness and immediately create a more spacious feel. Don’t obstruct windows with heavy fabrics, opt for a clean and sleek approach to your window dressing. A simple way to accomplish this is with living room shutters, which can be fit to the exact size of your window to ensure a crisp, neat finish. Keep open during the day for a bright, airy atmosphere, or close and tilt the slats slightly to maintain cooler temperatures while still inviting light in. 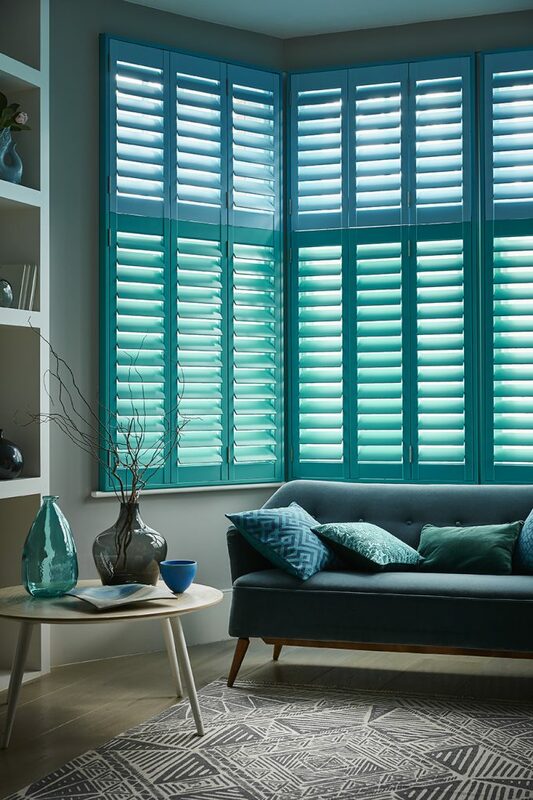 Draw attention to large windows by opting for coloured shutters. Subtle pastel tones provide the perfect accent to cooler toned rooms for freshness, or choose a vivid shade for a pop of colour – the key is to direct the gaze toward natural light. View our range of shutter styles and shades to find your perfect style. It’s no secret that a well-placed mirror will create the impression of space in small living rooms. Consider various shapes and styles when choosing a mirror for your space. Experiment by hanging several mirrors in a mosaic layout to add more visual purpose to a bare wall. Dark corners can be lifted with a long mirror and complimentary lighting. Remember to hang your mirror opposite a light source to ensure reflected light works hard to bring brightness into your living room. Where floor space is at a premium, avoid furniture with bulky bases and instead choose chairs and tables with slim legs. Not only will this prevent your room from feeling heavy and cramped, but it can also create additional storage solutions. Floating shelves are a good option for displaying personal keepsakes, books and photos without looking cluttered – let your ornaments be the focal point and stand out. Add some greenery to your walls by sitting a plant with long vines on the top shelf to direct eyes upwards and create a sense of length. In a smaller room, don’t be tempted to size down when it comes to rugs. A large area rug is a perfect option for a small living room as it brings the furniture together, rather than creating breaks on the floor. Choose colours and patterns that complement your surroundings, but avoid staying too neutral. Bold lines or a striking pop of colour add depth to really own the space. A rug is also a great way to add texture and define the style for the whole room. Keep things cosy with a fluffier pile, or for a sleeker finish to work with a more contemporary look, choose a more understated cut wool style. If you’re looking for a way to really open up your small living room, keep your base colour light and bright and build upon it with carefully selected pieces. Opt for a slightly off-white shade for the walls to avoid a clinical look that still radiates freshness. Strip back carpets and embrace the floorboards, reviving with a coat of paint to lift the room. Favour dusty greys or muted pastel tones to work with the walls. For furnishings, a white sofa with accents of vivid colour through cushions and throws will create an inviting yet airy space. Contrast sharp whites with dark natural wood textures with smaller coffee tables and photo frames to maintain a homely feel. Wooden window shutters can help to bring the whole room together. Find creative solutions to space storage with furnishings that can work double duty. Ottomans are perfect for additional storage that keeps clutter out of sight and when needed, can be used as extra seating. Coffee tables which double up as storage will stylishly disguise any mess while also creating a focal point that brings the room together.